Free PDF download of Indian Army General Duty 2018 question paper. The written exam of GD is solved and answer key of the questions are given at the end of the question paper. In this article, we are providing you Indian Army GD 2018 question paper with answer key in English / Hindi language. In this Indian Army GD 2018 exam paper, the question is of general knowledge 30 questions, general science 40 questions and maths 30 questions total of 100 marks for the 1-hour duration. 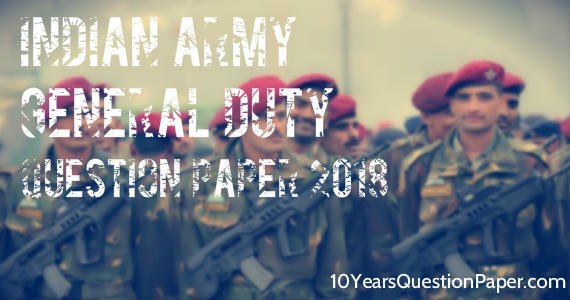 Indian Army general duty question paper with answer key 2018. The GD question bank of 2018 will help you in your preparation & your dream to join Indian Army. This 2018 question paper has been downloaded from joinindianarmy.nic.in. So download the GD paper in PDF with answer key and start preparing for the written exam. Indian Army general duty syllabus & question paper pattern. Indian Army Soldier General Duty (GD) question paper pattern and syllabus is given below. The GD paper is divided into three parts A, B and C. Part A is General knowledge, Part B is General Science and Part C is Maths and the passing marks is 32 out of 100 marks.